An estate agent friend of mine asked me the other day, “Sam, give me a better term for a grade II listed cottage than ‘Superb kerb appeal’, please? !” I offered a few adjectives, like ‘fairytale’, ‘captivating’ and ‘a slice of English history’, and he eventually settled on “Oozing charm and character”, which is pretty good I think. His question does highlight an interesting challenge that he faces: estate agents are not marketers. Nor are they copywriters. Or photographers. Anything you know about marketing properties has been learned on the job, without training. You have simply picked it up as they have needed to. Rewind to the pre-internet era of selling houses, and an estate agent’s job was rather different than it is today; of course they still had to write the property descriptions, but back then, it was perfectly acceptable to describe a living room as ’25’ x 13’, twin aspect, triple power points, double radiator.’ Now, that description would be met with derision. Once upon a time, one 3 inch square photo stuck onto the front of a type-written page would have been the norm for the property details; now a ‘brochure’ is expected, with at least eight full colour photographs, which brings me onto the next point: photography. These days, an agent is expected not only to have a substantial digital camera, at least £500 worth, but also to be able to use it like a professional. What is an estate agent good at? Talking to people, understanding their problems and situations, and providing the best solutions for them. Helping them move on, in every way a person can move on, in fact. Most of you have chosen their profession because you actually want to help people. You enjoy and value being part of your community, and feel privileged to feel such an integral part of it. You are fascinated by human nature, by what makes people tick, and have an encyclopaedic knowledge of every property transaction in their area since the day you first started. Am I right? Once upon a time, before the internet was a glint in Miles Shipside’s eye, marketing a property, and of course your agency itself, meant an advert in the local paper each week, and a chat on the golf course. Life was simple back then. Now, marketing is social media, website conversion, email marketing, blogging: the list goes on. How are you supposed to know how to actually do this stuff?? Things aren’t ever going to go back to the way they were. Most agents I know barely use print advertising at all. Direct mail is still effective, but response rates haven’t been above 1% for some years now, making it expensive and time-consuming. On top of that, when you actually get the instruction, vendors won’t accept the same property details that just five years ago would have been considered the ‘bees knees’. They want glossy, multi-page, expensively designed ‘brochures’. They have all become marketing experts, it would seem. So what can we do? We have to accept that estate agents are now marketers, with all that entails. This may very well mean you need to invest in training or outsourcing, and probably both. The days of writing ‘property descriptions’ in the literal sense of the words are now gone; vendors and buyers have high expectations of you, and you have to be able to deliver the goods. So, get some photography tuition, or hire a professional. Work out the best person in the office to do the copywriting, and get some copywriting training for them. They could then write the blog, tidy the website, and anything else that needs words choosing for it. In short: learn how to do the things you can’t, and outsource those you don’t want to do. By taking a professional approach to this very current challenge, you will actually free up your time and energy to do the stuff that you really got into estate agency for: helping people move on. You deserve it, and so do they. Previous post Who’s Your Pacemaker? Next post What’s Your Audience Worth? By becoming a qualified RICS member you are a professional surveyor. It takes a long time but what you become is worth it and your clients appreciate dealing with a trained and qualified consultant. If the Estate Agent isn’t expected to market the house who is? What would you regard the list of services an Estate Agent should be providing and does that justify the fee? Surly Marketing expertise has to be a core part of an Estate Agents skill set. On training what training do Estate Agents need? What skill are needed to “help people move on”? Do you have access to local buyers? Regional buyers and national buyers? Who would liaise with the other agents in the chain, their solicitors and mortgage brokers once you’d agreed the sale because they won’t talk to you (DPA prevents them doing so). No training or qualifications are needed to become an estate agent, professional agents will seek their own training like I have done over the past 21 years. I think Samantha has raised some incredibly valid points. This industry has changed immensely over the past two decades. Successful agents have adapted to their clients changing needs, poor ones have stood still. Please don’t tar us all with the same brush though Jon. If you think you can do better yourself marketing your home privately I challenge you to step into my (or my employees) shoes for just a week. I wouldn’t mind betting you’d change that opinion rather quickly. When lengthy chains are involved Estate Agents can provide a valuable job keeping things moving. I do see that this might not be visible to the seller. I don’t see leasing with Solicitors and mortgage brokers as being a core service that sellers accept they would be paying for. Solicitors need to the sellers and buyers to sign docs etc and as I see it the only thing an Estate Agent can do here is chase things up. I would rather my Estate Agent have good marketing experience that the ability to chase Solicitors around. Back to marketing, the big problem for me is answering the question what is an Estate Agents job? If I asked 10 Estate Agents to give me a list of what they thought the services they offered was I would get 10 different answers. I would imagine that there would be a core set that are the same and I would expect it to have marketing in there. When you break it down like this it just shows that if Estate Agents aren’t marketers and don’t need to have any marketing skills then what are they doing for their fee? This is so relevant right now. Building my local online only Estate Agency from scratch in 2013 has had it’s challenges. Sam has a very interesting point about marketing. Ever wondered why John Lewis hires a window dresser? Your pictures and words are your shop window, they are there to draw your buyer in. Adopting these simple changes will change a buyers perspective on a house. It doesn’t stop there, the viewings are equally important, the estate agent’s viewer should always know why the person is moving therefore focusing on these points too. No longer can a viewing be an open the door policy, get involved! I love these techniques Sam. I think that some agents just got lazy and complacent. Agents have a responsibility to ensure that the house is marketed properly to it’s FULL potential. These agents will shine as the public get more visual. Remember that everyone wants the most for their money, they will expect windows and plug sockets, they wont expect the south facing garden with built in barbeque for those hazy summer evenings with friends. Thanks Sam, once again you have opened a door of opportunity for agents. 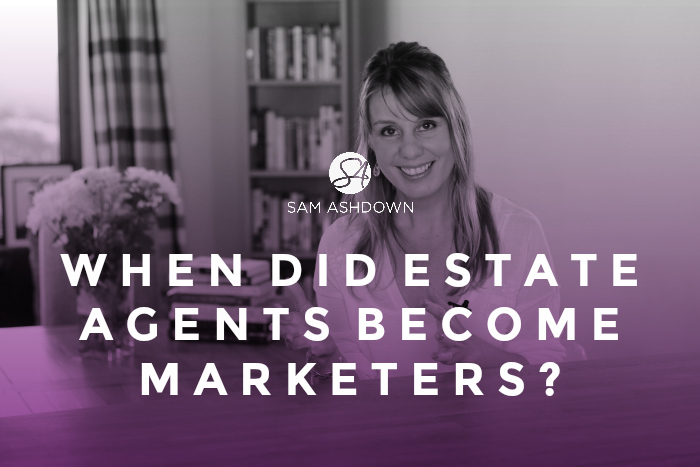 What I take from Sam’s highly interesting piece of work is that there are many distinct components in the profession of estate agent – and we may not be equally proficient in all of them. Recognising this is, as Sam suggests, the key to outsourcing those tasks to others who are better equipped to perform them. I don’t expect agents to be copywriters or the next Lee Child but their property descriptions could be more than telling us “what” a house is (4BR, 2.5 BA, LR, FR, fplc, etc.) and instead tell the consumer “how” the house benefitted the Sellers and will probably be a good fit for the next owner. Is there room to entertain? Does the kitchen offer room for more than one person to bake? Is the lot great for dogs to run or can you sit on the patio and watch the birds? Today’s buyer can get the info in their search. What we need to do is tell people (or show them with video and high quality photos) how buying this home will fit their life. I like the beneficial info you deliver on the articles or blog posts. We’ll bookmark your own web site and also analyze yet again listed here regularly. We’re reasonably a number of I’ll understand a lot of brand-new material right here! Enjoy for! Great article, Sam and many interesting responses. What’s to stop an estate agency hiring a marketing manager, as opposed to another Negotiator? The whole point of marketing is that it involves not just promotion but encompasses everything from people to pricing, to services. I wouldn’t expect ANY estate agent to be proficient at marketing, but I would hope they can be proficient at customer relationships. Stick to what you know best and hire the rest.